CHARLOTTE WELCOMES ALL GOLF ENTHUSIASTS | South Charlotte Newcomers! Charlotte is now humming spring’s symphonic sounds, sprinkled with just a whisper of pending summer breezes! Included in the melodies of song birds, children giggling in backyards and the outdoor concerts of The Charlotte Symphony and local bands; is the unmistakable sound of a well-hit golf ball! Golf is very popular in Charlotte and both private and public courses are sprinkled throughout the Charlotte area. Quail Hollow Club has hosted the PGA Tour in Charlotte each year for the past eleven years, during the first week in May. This prestigious event will be April 29-May 5 in 2013. 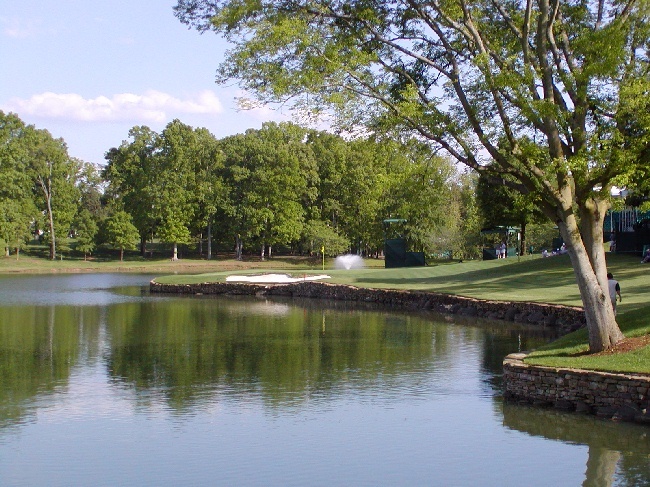 Quail Hollow Country Club Course and the Clubhouse are located at 3700 Gleneagles Road in Charlotte. Quail Hollow Club has what is considered by many to be one of the finest courses in the southeastern United States. The Quail Hollow layout features numerous bunkers and tree-lined fairways to provide a truly challenging round. The course features 7,114 yards of golf from the longest tees for a par of 72. The course rating is 74.9 and it has a slope rating of 139. Piper Glen Golf Course opened in 1989 and is Arnold Palmer designed. The course features a par 72, 6,853 yard course. Located a 4300 Piper Glenn Drive in the lovely Ballantyne area, Piper Glen is a private course. Ballantyne Golf Course is a member only course; located at 11120 Ballantyne Crossing Ave.
Tee times can be made up to 30 days in advance online or 10 days in advance by calling the golf pro shop. Driving range and putting greens are available to the public and guests. Located just down the road is the The Ballantyne Resort Golf is a public course offering year-round play. It is a championship PGA course located at 1000 Ballantyne Commons Parkway. It is an 18-hole, par 71 course.The Ballantyne Spa and Resort offers beautiful rooms, delicious meals and luxurious spa treatments as a way to end your golf experience. Charlotte Country Club was founded in 1910 and is located four miles east of bustling uptown Charlotte, in the historic Plaza-Midwood neighborhood. The yardage is 7,335 yards with a 75.9 rating and 146 slope. Charlotte Country Club permits up to six member-sponsored Golf Outings each year. Carmel Country Club offers members two championship 18-hole courses on 384 acres of landscape. North and South 18-hole courses offer wonderfully different golfing experiences. The club is located at 4735 Carmel Road. Public Courses are also located throughout South Charlotte, offering a great golfing experience for all! Carolina Lakes Golf Course is a public course located just minutes from the South Charlotte/Ballantyne area. Carolina Lakes Golf club is considered challenging, but fair par 72m 7,024 yard course. Springfield Golf Club is located in Fort Mill. The Clyde Johnston design is surrounded by trees and is a hilly site. It is a 6,906 yard, par 72 course. The Golf Links is located at 11500 Providence Road and is considered great for the bargain-hunting golfer. The course has 6.700 yards of golf, par 71. It is a 18 hole, regulation length course. Yes, the resounding “thwack!” of golf balls well hit is a true sound of another beautiful spring and summer in Charlotte! And if YOU would like to live in a Charlotte Golf Course community, call us – there are plenty of wonderful properties currently FOR SALE! 704-541-2500.